← Samsung’s non-existing printer support: Do you have hours to waste? I hope TIFF will understand the seriousness of Double ticketing and properly train their employees to do the legal thing in the future. Secondly, I have tried to reach out to TIFF and hope TIFF will do the right for the troubles my friend and I have to go through in this case. Sure, I enjoy writing this article and sharing my knowledge about Double Ticketing and Competition Act with other Canadians, but my time and energy can be better used in other areas if Toronto International Film Festival had actually done the legal and proper thing in the first place. On top of this article, I have tweeted and raised my concerns directly to @TIFF_NET and @cameron_tiff. Will see what happen, stay tune. “- Due to my past experiences that the first day might not have all the souvenir products ready, I called TIFF on Aug 23 morning first to inquire about the availability of the TIFF 2011 souvenirs. The person on the phone put me on a hold and after a short wait, I was told that the TIFF 2011 souvenirs would be set up / ready by 4 pm that day (i,e, Aug 23). So on the next day, Aug 24, I went to the Festival Box Office (225 King Street West) and found out that that location only had the Programme Book, not souvenirs. (In the previous years, I always bought the Programme Book and the souvenirs in the same place; no more one-stop shopping this year.) I then walked to the gift shop – TIFF Bell Lightbox Office (350 King Street West). * Note you will see that this location closes on Aug 22 on the website* Fortunately this was a 2-block walk of short distance. Tho it was raining lightly, the walk was not a big problem. 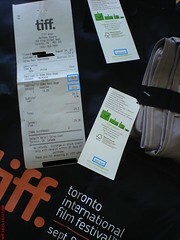 This entry was posted in Customer Service and tagged 2011, Competition Act, Consumer Protection, Criminal Provision, TIFF Double Ticketing, Toronto International Film Festival. Bookmark the permalink.